Reason for Reading: I saw Codex while browsing through an Amazon Hot 100 List. Why you should read this book: Codex is a dreamy, engrossing story you might want to check out if you’re looking for a slow-paced ‘thriller’ with a somewhat literary slant to it. All of the backstory about the codex and other historical literary works provide lots of interesting information that help make the search for the fabled book continually intriguing. If the thought of breaking into a library to find a forgotten but important medieval work sounds perfectly reasonable and not hopelessy geeky, Codex should be right up your alley. Why you should avoid this book: Frankly, the comparisons with Dan Brown’s book The Da Vinci Code aren’t working in Grossman’s favour, as they create the expectation that something might actually…well, happen in this book. 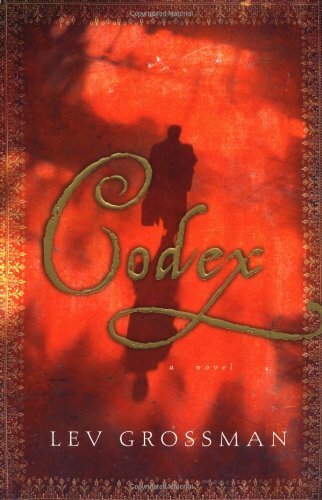 Codex also begs comparison to (in other words: is a blatant rip-off of) A.S. Byatt’s novel, Possession, but greatly dumbed down. Despite this, Grossman manages to make the stodgy Edward seem at least a decade older than his 25 years, which doesn’t say a lot for his character development. The tie-in with the computer game and the story in the codex feels like goofy and pointless filler. If you’re not keen on detail, be warned that Grossman seems to suffer from AA – Adjective Addiction. Edward Wozny stood squinting at the sun as crows of people excused themselves past him in both directions. It was hot and bright. He was wearing a very expensive gray handmade suit, and he had to check what seemed like dozens of inside and outside pockets of various sizes and shapes before he found the scrap of paper he was looking for. Edward was starting to enjoy watching her talk. It was all so different from what he was used to: This was somebody who spent all her time just reading and thinking about what she read. In a way it seemed like a ridiculous waste of time; and in another way it seemed so much more urgently important than what he did all day. Or used to do. They waited. The buzz from the beer they drank earlier was starting to wear off. ‘What did you call this thing again?’ Edward asked. Also recommended: Possession by A.S. Byatt; The Da Vinci Code by Dan Brown; Booked to Die by John Dunning; The Blue Nowhere by Jeffery Deaver. Also by this author: Warp. Fun tidbit: Grossman wrote an article for Salon.com confessing that he posted numerous anonymous reviews on Amazon of his first book, Warp, in an attempt to bolster his book’s rating.